The viola part for Ravel's Daphnis and Chloe (Daphnis et Chloé) has been edited by Israeli-born Yizhak Schotten, an internationally acclaimed musician whom STRAD Magazine has called "one of America's finest viola players... a leading light of the U.S. viola establishment." Schotten's bowings, fingerings and other editorial markings have been added throughout the score. Maurice Ravel's Daphnis and Chloe (Daphnis et Chloé) is a ballet and, at about an hour runtime, the composer's longest work. The music, some of Ravel's most passionate, is widely regarded among the best of his compositions, with extraordinarily lush harmonies typical of the impressionist movement in music. Ravel began work on the score for Daphnis and Chloe in 1909 after a commission from Sergei Diaghilev. It premiered at the Théâtre du Châtelet in Paris by his Ballets Russes on June 8, 1912. 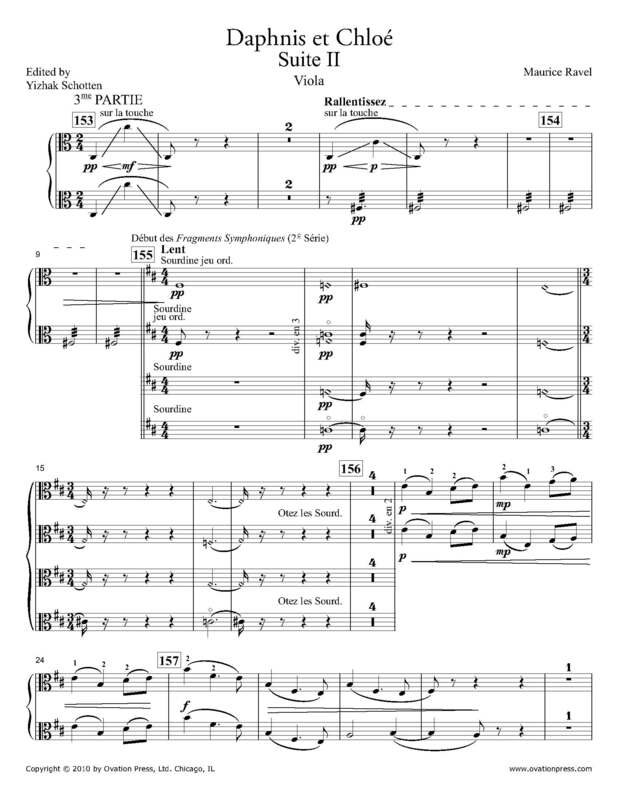 Download and print the score today to gain access to expertly edited Ravel Daphnis and Chloe viola fingerings and bowings from Yizhak Schotten! Please note: This edition is Suite II. This score is only available for purchase by customers located in the USA and Canada.